Playfully referred to as the People's Republic of Boulder, this city nestled in the foothills of the Front Range was recently named “Happiest City in the U.S.” by National Geographic and is known for progressive attitudes stemming from its hippie heyday. Today it’s characterized by scientific research centers, the University of Colorado, artsy folks and hyper-athletic citizens. Just 45 minutes from Denver’s airport, with 45,000 acres of gorgeous and easily accessible wide-open landscapes, a walker- and biker-friendly compact downtown and plenty to do, you’ll be just as inspired as the locals to enjoy a day packed with activity. The pedestrian Pearl Street Mall is the city’s hub. Fuel up at any of a dozen coffee shops alongside students and freelancers clicking away on their laptops. Then, spend time strolling the thoroughfare, lined with historic buildings that now house boutiques and longtime-favorite shops and populated by talented open-air performers. For more shopping, head to Twenty Ninth Street, an outdoor mall headlined by H&M, The North Face and Apple that also has a new outdoor beer garden called The Barrel. Or hook up with Boulder Walking Tours to see Boulder through its neighborhoods, historic areas and open spaces. Saturdays and Wednesdays April–mid-November, stroll Boulder Farmers’ Market, with a strict sell-what-you-grow policy and a lovely setting next to Boulder Creek. Chefs are often spotted shopping here, so you may taste market veggies during dinner. If you dig the market, you might also appreciate The Boulder County Farm Trail — 20 farms and other places where you can pick berries, pet animals, take a tour, check out a farm stand, picnic in a barn or take a class. Creativity is found in every corner of Boulder, with more than 30 galleries, four museums, many theaters, dance studios and a large number of cultural performances each year. And two art-film houses share innovating filmmaking — the Boulder Theater downtown and the Boedecker Theater (aka “The Boe”) at the Dairy Arts Center. Head next to the Dushanbe Teahouse to admire the intricate paintings and carvings adorning this building that was shipped, piece by piece, from Boulder’s sister city in Tajikistan. Have a bite to eat and order a pot of tea from the teahouse’s exhaustive menu before embarking on your afternoon adventures. Discover the hiking trails that cater to avid outdoor lovers. 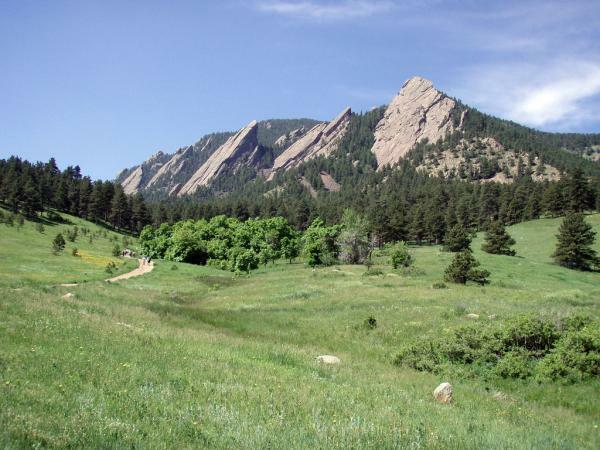 National Historic Landmark Chautauqua Park has a network of trails to suit every level of hiker and will give you an up-close view of the Flatirons — the slanting slabs of red sandstone that are Boulder’s most recognizable landmark — framed by a meadow that blooms with summer wildflowers. Hikers can ride the free Park-to-Park shuttle to designated areas in and around the Chautauqua Park area. The dog-friendly bus runs on Saturdays and Sundays from Memorial Day through Labor Day; just park your car downtown or at a free lot on the University of Colorado campus and hitch a ride. Stop into Chautauqua Dining Hall, which has been serving Boulderites since 1898. Boulder's food scene is one of the reasons Bravo's "Top Chef" is filming its upcoming season in Colorado, so dinner at one of the city’s restaurants is a must. Wander around the Pearl Street area for plenty of award-winning options, including Provencal-inspired Mateo; Pizzeria Locale’s traditional Neapolitan pies (brought to you by the chefs at another Pearl Street favorite, Frasca Food & Wine); or The Kitchen, an eco-friendly bistro that pairs food with decadent brews. After, visit a brewery to taste the local suds and take a tour — there are more than 20 now, pretty serious for a town of 100,000 people! In fact, Boulder has more breweries per capita than any other city in the U.S. Pick up a Boulder Beer Trails brochure at area visitor centers, take a walking tour from Boulder Brew Tours or catch a ride on the Colorado Brewery Bus. Then head to OAK at fourteenth, where Vanity Fair-featured mixologist Bryan Dayton demonstrates the art of handcrafted cocktails for your sipping pleasure. Another thing brewing in Boulder is kumbacha. Taste this fermented tea that’s full of probiotics, beneficial yeast and enzymes at Upstart in north Boulder or Rowdy Mermaid inside Rayback Collective — a food-truck park/beer garden/live-music venue that’s drawing those in the know east of downtown. Boulder is close to Rocky Mountain National Park (1 hour), Eldorado Canyon State Park (15 minutes) and Golden Gate Canyon State Park (45 minutes). In Longmont, you’ll find golf courses, beautiful parks and a Certified Colorado Creative District. Survey the work of local artists in galleries and coffee shops. The area’s brewery scene is also noteworthy. Left Hand Brewing Co. and Oskar Blues’ Tasty Weasel Tap Room are longtime favorites, while 300 Suns, Longs Peak Pub, Großen Bart, Shoes & Brews and Wibby opened their doors wihtin the last few years. For those seeking thrills, Mile-Hi Skydiving Center hosts excursions to Longs Peak for divers of all experience levels. be unlike any other town in your vacation repertoire. Case in point: Each March, Frozen Dead Guy Days celebrates the remains of a man who died of a heart attack in 1989. His family keeps his body preserved in dry ice in the hopes that future science can revive him. Celebrate Ned’s nutty culture with craft brews, art and live music. Stroll downtown and experience the ambiance by browsing around local shops and restaurants. While not a traditional ski town, Boulder was named a “Top Winter Town” by National Geographic Traveler for its proximity to skiing and charming downtown vibe. The magazine cites the ability to ski nearby Eldora Mountain Resort in the morning and head back down to town for a hike or bike ride in the afternoon. Non-downhill skiers love Eldora’s Nordic Center, which offers lessons and trails designed specifically for cross-country skiing, skate skiing and snowshoeing.